Search Results for "paddle boarding"
Paddle Boarding Couple paddling out to sea, standing and sitting. Calm blue sea. boat in background. 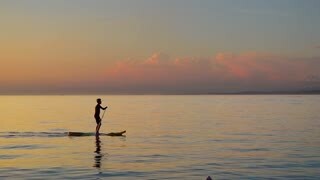 SUP board on the sunset sky background. Stand up paddle board man paddle boarding on SUP.